It’s a stoppage that will likely go down as one of the most controversial in UFC history, but referee Herb Dean thinks the call he made at UFC 235 was justifiable given his vantage point. Dean was on-hand at T-Mobile Arena in Las Vegas on March 2 to oversee Ben Askren’s highly anticipated debut against former UFC welterweight champion Robbie Lawler. The fight was developing into an instant classic, with Lawler slamming the two-time Division 1 NCAA wrestling champion to the mat and nearly finishing him with ground-and-pound, only to find himself defending a choke moments later as Askren scrambled and recovered. Askren had Lawler in a bulldog choke and then — depending on who you ask — Lawler either relaxed his arm for a second or he went limp. In Dean’s eyes, it was the latter, and that was all he needed to see to wave off the bout, much to the surprise of Lawler who immediately shot up and mounted a brief protest before calmly talking things over with Dean. At the time, Dean appeared to be apologetic. Though the veteran referee isn’t exactly thrilled about having to make a tough call that possibly ended an exciting contest prematurely, he explained on a recent episode of The Joe Rogan Experience that when it comes to maneuvers like the bulldog choke that not only put pressure on the neck but potentially threaten the spine, he’s not taking any chances. “When I see some chokes, a rear-naked choke, especially with the guy on the back face up, I take a sigh of relief. My job just got so much easier,” Dean said. “This guy, it’s not like he’s gonna go out and then a second take some extreme amount of damage. He may go out, I’ll have a second to make sure — not even a second — a half-a-breath to make sure he’s okay. And then let it go out and he’s not gonna take any other damage. 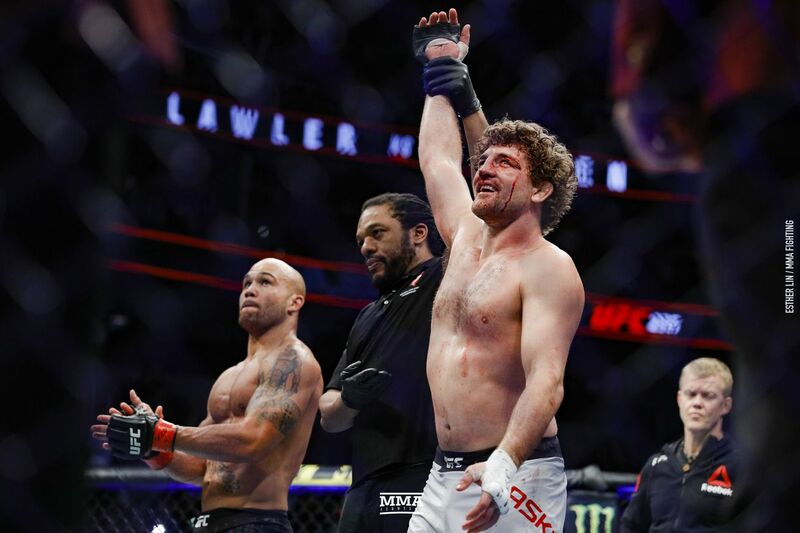 Dean praised the toughness and talent of both Askren and Lawler and added that he understood why people would be so upset with his split-second decision. However, he’s not changing his mind on the matter based on knee-jerk reactions and armchair critics. “We never want to see anything that could make you have a feeling that it’s inconclusive, but I can’t think of what else I should have done,” Dean said. To illustrate his point, Dean mentioned a dangerous submission hold he’d recently seen used in a fight, a choke variation from back position that allowed the attacker to not only cut off the target’s air supply but also put intense pressure on their neck and spine. Dean knew that the fighter defending against the choke was in danger, but couldn’t justify stopping the fight. When the tap finally came, his fears were confirmed, though fortunately the damage turned out to be minor. “I was sitting there and I was like, ‘This isn’t illegal,’” Dean said. “If I stop this fight, this is not an illegal move, but I don’t want to see how this plays out and the guy got one hook in and almost the second hook was about to go in, the guy tapped, and when I pulled him off, the guy couldn’t move. Having officiated MMA fights for almost two decades, Dean has seen it all, including his fair share of early and late stoppages that have drawn scrutiny from fans and critics. He has also widely been praised for his experience and is regularly given high-profile assignments in the UFC. Dean stressed that fighter safety and professionalism matter above all else to him, which doesn’t always sit well with everyone. “That is the tough part about it. We’re evaluating situations, you’re evaluating a threat to the person, you’re evaluating if there’s a threat coming, how well can they deal with it. There’s a lot of stuff going on there,” Dean said. “We take it really serious, I take it really serious. To me, I feel that I have a sacred trust. I feel that it’s one of these positions that, like — our athletes are not stupid people. A lot of them could be doing a lot of things with their life, and they’ve chosen this path and they take time from their family, they take time away from other careers where they could be progressing, and all to meet their dreams and hopes, and I need to balance that with their safety.